Which Mascara and Eye Pencil is the Best for Black Eyes? Black eyes are believed to have eastern origin. People with black eyes are considered to be very passionate, involving and active. They are full of love to the whole world and are ready to share it with all the others. By the way, there are lots of magicians and psychics among those who are lucky to have black eyes. Which Mascara and Eyeliner is the Best for Black Eyes? In addition such people are always good leaders even despite the fact that they sometimes overestimate their own abilities. However they are very clever and very quick-thinking. Another great feature of their character is the fact that they have a very strong will. It seems like there is nothing that can stop them on their way to achieve a goal. People with black eyes are always surrounded with lots of secrets and mysteries. That is why the majority of men consider women with black eyes to be very mysterious and unavailable. They are eager to find out more about these beautiful creatures. However they should be very careful as they can be easily trapped by the force of this beauty. Black eyes call for a very bright make-up. Despite the fact that black color has already become classical, it is the best choice for your daily make-up. Evening make-up calls for brighter colors. That is why violate, lilac and cornflower colors will be the best bet in case you want to stress the beauty of our eyes. 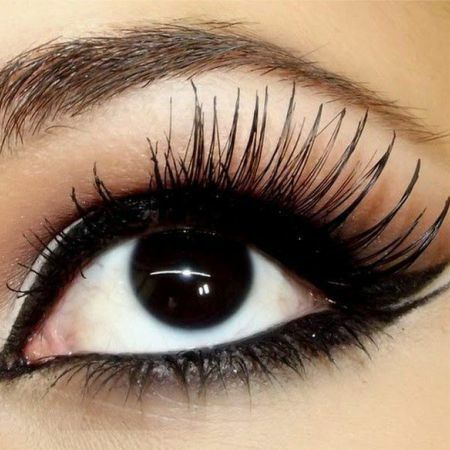 The main condition is the high level of intensity of the mascara. One of the main natural features which have women with black eyes is their dark eyelashes. It makes their life much easier as they do not face any difficulties in creating their daily make-up. All they need is a couple of moves of the brush using separating mascara. You should avoid using volume mascara unless it is the case of necessity when you need to create a bright character for the evening. Bright colors and shadows will make it possible for women with black eyes to stress the beauty of their eyes. You will also need a bright and soft eye pencil. Thin black lines will help you to create an elegant daily make-up which has already become traditional for the majority of women. Evening make-up will color for more dare colors. You can use dark-blue, dark-violet and black-brown eye pencil. Some experts also recommend using lilac, emerald and purple colors. Black eyes are very bright. That is why you need to create a make-up of the same brightness. However it should be very accurate and at the same time elegant. Start with your eyebrows. You need to create a good shape which will be thick enough. You should avoid making a thin line over dark eyes as you will have a ridiculous look. We have already shown you how to choose mascara and pencil for black eyes. 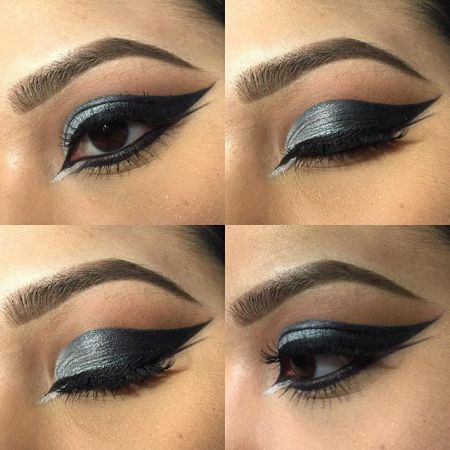 However there is another way to create a perfect make-up with the help of liquid black eyeliner. All you need is to learn how to make straight lines correctly. Like the article «Which Mascara and Eye Pencil is the Best for Black Eyes?»? Share it with friends!